Here I am with my 34 week belly!! Look how round it is! I love it! RJ is taking swimming lessons! RJ just started swimming lessons at Letchworth Splash and he really is doing well. He loves going which is great! This is only his first week. He was worried at first because he wanted to bring his floaties but he is not aloud to use them. HE does not want to go under the water though. No way! He actually went under with Kat, his instructor, on Monday and he was fine but since then he has been scared. Kat is really good with him and the other kids his age. She is patient but still makes them do things that they are a little fearful of. She did not make him go under this time which I liked because you could tell he was really scared. He was very proud that he went on his kick board all the way to the other end of the pool all by himself! I was proud too!! He is getting so big and he is a kid that any parent would be proud of! Just wanted to share a picture of Carley was taken a month or so ago. 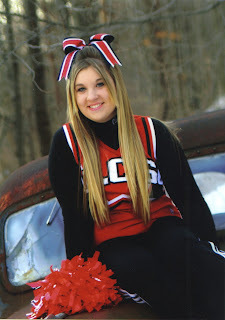 She really enjoys cheer leading and is very good at it. She will be a junior next school year so the college search will be on!